One of the things that came up my mind when I thought about what I would want to do while he is away was: eat fish. Since he hates fish and seafood of any kind - their taste, look, smell, or everything - I hardly ever cook or eat fish at home nowadays. One time I had an urgent desire for fish and cooked a couple of fillets of salmon for lunch, which put him in a bad mood for a while. So I just gave it up. It's a bit shame considering we are in a place that is supposed to have good/decent fish... but well, that's too bad, all I can do is to eat as much fish/seafood as I can when I'm back in Japan. Anyways, I thought, I should better take this opportunity when I could. And I didn't really need to wonder which fish to have; mackerel. Mackerel used to be one of fish that I least favored when I was a kid, but when I had a fillet of broiled semi-dried mackerel, it permanently changed my perception of mackerel products. Even though I still don't care for this fish cooked in other ways, this is definitely something that I have a craving for from time to time. So I had made up my mind. Yesterday I went to a store nearby, searching for semi-dried mackerel. I remembered that I had seen packaged fillets of mackerel in that store before, and it didn't take me so long to find them - but they were raw mackerel. Hmmm... I don't like them raw much, I thought, and went to look at the frozen food section, and there you go, I found... frozen raw mackerel. After another seconds of hmmmmm..., I spotted vacuum-packed smoked mackerel. Smoked? I had never had them smoked before, but since I knew that I didn't like broiled raw (I mean, not dried one) mackerel, I chose to try the smoked ones. I dropped by the grains aisle and picked up a small bag of sushi rice; I'd usually buy Tama-nishiki, a California-grown, short-grain premium Japanese rice brand, but this time I bought something else, primarily because the brand of my favorite wasn't on sale. Anyways, I was all set. This morning after I got up, I cooked a cup of rice in my shiny blue Le Creuset Cocotte Ronde, while grilling all three fillets of mackerel; I wouldn't have a chance to cook fish once he's back, so better cook them all and freeze the leftover, I thought. Meanwhile, I also made quick cucumber "pickles" (just rub sliced cucumber with salt). 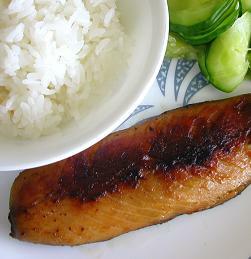 Freshly cooked rice, broiled fish, and pickles... this is going to be like a "traditional" Japanese breakfast... I was very excited. My plan of making my "traditional Japanese-style" breakfast as authentic as possible confronted another big challenge; I don't have any Japanese tableware, not even a pair of chopsticks. None. So the only option in this case was put the food on a ordinary, cheap dish that we have here and eat it with a folk. Finally my time had came - eat the fish. Smoked mackerel smelled and tasted like smoked fish, and I found it pretty good. Cucumber wasn't as good as I hoped - well, the cucumbers that I had bought at the local farmers' market the other day were labeled as "Japanese cucumbers", they weren't exactly like the ones back home (nor is any brand of Japanese rice, really, but I think it was okay). This particular brand of rice that I had chosen, though, turned out to be highly disappointing to me, unfortunately. p.s. I made another batch of microwave cake and was going to write about it, but I think I need to go to bed now... tomorrow should do. Leave him. He's not worth it. product needed from your store . and we like to know whether you ship via fedex to united kindom .